(CNN) -- Considered one of the greatest racing drivers of all time, Michael Schumacher has dominated the world of motorsports since his debut in 1991. Having won a record seven world titles, Formula One's official website called the German "statistically the greatest driver the sport has ever seen" when he began a three-year retirement in 2006. He's had an unrivalled career -- but not without its ups and downs. The 41-year-old's first season back on the grid with the Mercedes team saw him finish in a disappointing ninth place in 2010. But Schumacher remains defiant about his decision to return to the sport, telling CNN: "Whether I put in dispute my reputation ... I just feel good about my decision and I have so much support from people." Schumacher's love of racing began at the tender age of four, when his father strapped a motorcycle engine to the back of his go-kart. At six, he won his first championship -- in go-karting -- which he said spurred his passion further. 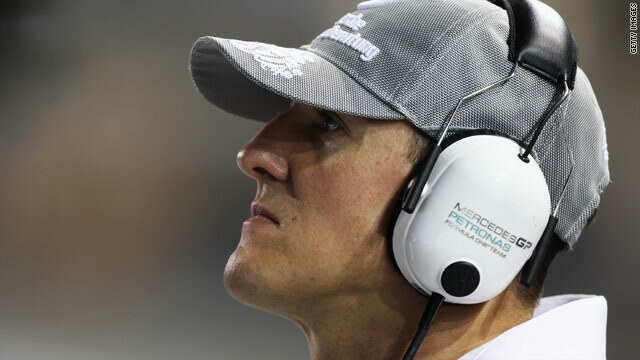 In an interview with CNN, Schumacher reflects on his achievements and the motivation behind his return to the sport. CNN: How did you start your interest in motor racing? Michael Schumacher: I think it's all the fault of my father, that he took my old kick go-kart -- that I used to run when I was two or three years old -- took it apart, took an motorcycle, which he found when we'd been fishing together in the lake ... checked the engine was still functioning and he mounted it to that kick go-kart. We ran on the pavements at home, scared some neighbors off the pavements and then decided it's probably better to go to a real race track with this thing and try it under more safe circumstances. CNN: How old were you? CNN: The bug hit when you were four? MS: Yes, and I mean being on a race track, seeing the other kids running with go-karts, then my father was obviously trying to get one that was suitable for me. I think I was five when I had my real first go-kart. CNN: When was the first big milestone for you? MS: The first big happening was when I was six. I won this club championship when I was six years old because I was fortunate enough -- although I didn't have the best go-kart -- because I was so small and so light. I had an advantage from the weight side and I won this championship and I thought, "I'm there; straight away I can do this." CNN: How did it feel to win your first grand prix? MS: Magic, very special. You arrive at Formula One being very skeptical how far can your talent deal with all this and then you understand those guys are human and pretty reasonable, and finally succeeding in winning your first race, in circumstance as such, it was just an amazing moment. CNN: Are you prepared to win at all costs? I retired simply because I didn't have the passion and motivation anymore, I was tired. MS: No, it has to be within a frame of what's allowed, but within that frame, yes, I push things to the borderline. CNN: Why did you retire? And why did you come back to Formula One? MS: I retired simply because I didn't have the passion and motivation anymore, I was tired. At the time I thought, "Well, I had a great time, there is the end." At some moment there is the right time to call it an end. There's other opportunities in life that I can enjoy now, and I did. I did deeply enjoy the freedom I had, and vice-versa, I'm more than happy to have made the decision I did last year. CNN: Why take the risk? You had so much more to lose than to gain? MS: I enjoy it. I feel I have the right to do what I enjoy. Whether I put in dispute my reputation, what I do in the past, that's a question you can see from many different angles and anyone can have his own point of view about it. I just feel good about my decision and I have so much support from people. CNN: Are you addicted to danger? Speed? Thrills? MS: I know what you mean, yeah I'm addicted to the challenge -- that's the right word. The adrenaline you very often talk about in Formula One doesn't really exist other than in moments when you have an uncontrolled accident. That's the moment when you get the shot of adrenaline, otherwise you are in such a controlled mode that you just get into the hype of running a car onto the limit that is pure pleasure and fun. But this is nothing to if you go for a sky dive -- yeah, that's adrenaline. CNN: Are you the greatest driver or greatest F1 driver? MS: No, you have to talk F1 driver, there so many different categories. If you take Sports Car, DTM -- my brother is doing that, I tried that, no way I could be that successful compared to what I have been in F1, I didn't have the feeling. CNN: Do you enjoy being a celebrity? MS: No, away from the track I like to be the private Michael Schumacher with his family and friends. But, naturally with the fame and my success, I've been able to find partners and partnerships who both can take profit from each other. This is something I enjoy doing if the partnership turns into friendship.